How did today’s known lead become a prospect? Did they click a digital ad on a site like LinkedIn, then check out pages on your company website? Which pages attracted their notice? Did they read a white paper, an executive briefing, or some other piece of digital content? Too often, until this person fills out an online form later in the process, marketers have no way to answer to these questions. Now marketers can gain insight into the early stages of the buyer journey and properly attribute revenue to all marketing spend. Full Circle Insights’ new Digital Source Tracker product takes the mystery out of anonymous digital touches, giving marketers a more complete picture of the first steps of the buying journey. Available today, after successful beta testing with Full Circle Insights customers, Digital Source Tracker follows prospects on the journey from anonymous visitor to known lead. According to Demand Gen Report’s 2018 B2B Buyer Survey, although sales cycles may be lengthening, most critical decisions are made within the first 90 days; 41 percent of buyers conduct anonymous research during this time period. That percentage is equal to the number of buyers who interact with vendors or view demos during the first three months of a sales cycle. Past surveys suggested that “top-of-funnel behaviors were mostly digital and anonymous.” Anonymity at the top of the funnel — or at any point on the customer journey — denies marketers critical insights on campaign effectiveness. The latest survey suggests the problem is even more acute since customers are making major decisions early on, often before they show up on sales’ radar. Marketers are under more pressure today to produce hard numbers that demonstrate marketing program success. By pairing prospects’ anonymous digital touches with identified leads in the CRM, Digital Source Tracker reveals which channels, programs, vendors, and content are driving revenue — and which aren’t performing as well as expected. With this data, marketers can make more informed decisions about where to invest marketing dollars so they can successfully allocate and optimize digital spend. 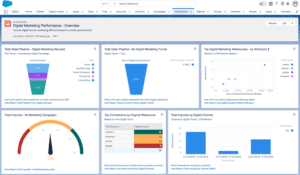 Digital Source Tracker is built on Full Circle Insights’ flagship product, Response Management, which gives marketers the power to drive revenue with campaign attribution and funnel metrics data all within CRM, the database of record. Response Management provides clear, accurate insights that help demonstrate results, drive quantifiable growth, achieve campaign ROI, and plan with confidence. With the addition of Digital Source Tracker, marketers can measure full-funnel impact from the early digital stages to closed-won revenue gaining a comprehensive view of how digital marketing strategy affects pipeline and revenue. And since all digital touchpoints are tracked within CRM, marketing and sales users are aligned on metrics and share a single source of data truth. The bottom line — Digital Source Tracker gives marketers a more complete understanding of the customers’ buying journey. It allows marketers to connect the dots between digital offers and buyer actions, extending Response Management’s multi-touch attribution modeling capabilities and funnel metrics to upstream milestones. Contact us to learn more or schedule a demo.